During 2017 I wrote 18 blog posts. This is a high increase respect 2016. 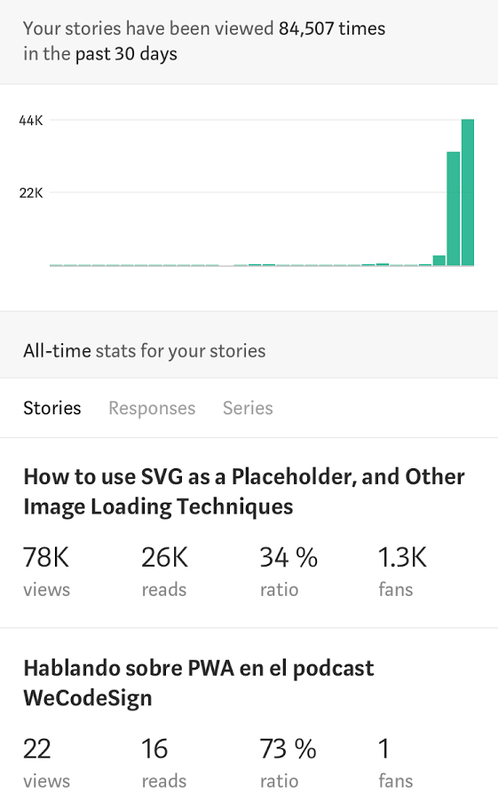 My post Using SVG as placeholders — More Image Loading Techniques was an unprecedented success. It was widely shared and got the attention of freeCodeCamp, which spread it even further. That escalated quickly. From a couple hundred views a day, suddenly it went up to +40k. The post made it to the top of Hacker News, renowned sites about frontend articles (CSS Tricks, Webdesigner Depot, Adactio), and newsletters (CSS Weekly, Smashing Magazine, React Native Coach). Most of my work to write that post was about ollecting ideas and examples from very talented developers. I’m happy that lots of developers have found out about them through this post, and I hope this serves to give more attention to their impressive work. Not only was the SVG post published in the sites I love reading. Some other posts of mine got referenced from Addy Osmani’s excellent images.guide, Perfplanet’s calendar, and Cloudinary. This is definitely a push for me to continue documenting techniques to improve website performance. On a broader note, I continued making improvements to this blog. I moved many images to Cloudinary, which scales and reencodes the images to tailor them to the user’s device. This resulted in shorter load times, especially in 3G. I should strive for good performance on a site that promotes it. I built a couple of open-source projects related with Spotify. The first one is a library to interact with Spotify’s Connect API called spotify-player which I described on Playing with the Spotify Connect API. The second one is C - Collaborative listening, a collaborative room where users can propose, vote and listen to music. This year I spoke at RenderConf in Oxford, JSDayES in Madrid, Alicante Frontend, and Frontfest in Moscow. I also attended React Alicante‘s first edition, in my home town, which I enjoyed a lot. I was interviewed by Isabel Romero, who works at ULab, the coworking space in Alicante that hosts the meetup Alicante Frontend. You can watch the recording on Youtube. I kept having fun at Spotify working in a fabulous team that builds Spotify’s web player amongst other projects. My priorities for 2018 are shifting. I’ll spend more time with my family and less time coding and writing. I would like to read more about leading change in organizations and soft skills, and less about the latest CSS and JS news.